Ok, so, one of my friends asked if they could adopt a Neonaark and make their own character of that species. Sadly I really don't want to adopt out my species, they are all personal and special to me. But, I had the idea to make one that isn't so personal, so if anyone wants to adopt one of my creatures and make their own character, they can. 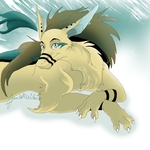 You can make as many of them as you like but you must give me credit and either a link to my deviantART gallery, or my website since I made the species. I still own the species, you cannot make one of these and then try and sell it. The Demivarks are for PERSONAL USE ONLY. You can roleplay with them if you wish. If you have a friend who would like one too, just send them to this page! It would be nice if you wish to adopt one, you could send me a link of your drawing of it. I'm interested to see what colours everyone comes up with. The Demivarks in the examples here are EXAMPLES. They are NOT Demivarks up for adoption; they are merely to show the colour types you can use. They can be good or evil, in all unnatural colours, all natural colours or a mix of both. Any colours are fine so long as they follow the rule in the picture: Mane must be a darker tone of the upper colour and the eyeflash must be a lighter tone of the lower colour. Stripes must be black. They wear gold rings for accessories. The richer the Demivark, the more gold rings they wear. If you send me a link to the pic of your Demivark on dA, I will link it here so others can see! These will be CLOSED for adoption if I choose to delete this for whatever reason. In that case you can still keep the ones you make of course but no one will be able to adopt any more. They MAY be limited adoptions, depending on how this goes. I've never done this before so its a bit of an experiment lol! I think that's about it rule wise. If you want one, feel free to go ahead and design and draw one. They are free to create. I thought it would be nice to give something back to my watchers and friends. do you have some information of this specie? I did write some out for someone before my computer went down and I lost the email. I leave the species information up to people to make up, since it's a free species. Sure! I'd love to see it when you have! Glad you like them! Thanks for the ! Does the "vark" come from aardvark? Can you ride him just like the thing from alice in wonderland? COULD I MAKE a fanart out of it? Lol yeah that's the idea. Read the rules I've put in the deviation description and you can make your own ^^ Yes they can be ridden if you wish! Awesome, I look forward to seeing! Ooh, nice. Love the whole split upper/lower color thing. Me too. I was wondering how they would be coloured when I thought of that and it works. It might have been on my Paul pic or my Paul stamp or this picture of the Demivarks. That's what we've been talking on. I think it was cos you've replied on the other two. Awesome, have fun with it and I'd love to see it when you're done! Eee! Awesome! Can't wait to see! How awesome, a Demivark!! I simply must make one! I'll put a link here once I'm done. And thank you for allowing us to adopt, I know how much a personal species can mean and you are so clever! Aww thanks! I hope you enjoy designing one! I look forward to seeing as well, they seem quite popular, which makes me happy because I put effort into thinking them up. i really wanna make one!! might try at some point!